When you get to the checkout counter, you have a decision to make. How are you going to pay? Let's assume you're like a growing number of consumers these days and you don't pay with cash. That leaves plastic, but what kind of plastic? Traditionally, if it's a small purchase, a consumer might be more inclined to use a debit card. But a new report from CreditCards.com finds increasingly, consumers are putting small purchases on credit cards instead paying for the purchase immediately with a debit card. The survey found that 17% of consumers with a credit card use that to pay for a transaction under $5, up from 11% a year ago. 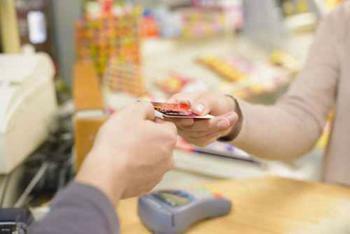 There was a decline in the number of consumers using a debit card or cash to pay for a small purchase. The survey doesn't explain why this trend is developing. It may be that more consumers are using cash back or rewards credit cards, and see the benefit of using the card for every purchase. If so, that might not be a bad strategy. But if consumers are relying on credit cards for small purchases because there is less money in their checking accounts or their wallets, that's not a good sign. "If you pay your balance off in full each month, there's no reason not to use credit cards for these small everyday purchases," said CreditCards.com Senior Industry Analyst Matt Schulz. "They're convenient, they're safe, and over the course of a year, all of those little cash and debit card payments can add up to a real missed opportunity to collect cash back rewards." But if you don't pay off your balance each month, all those little $5 purchases are adding to your debt, costing you 15% or more in interest. Credit cards are still the payment of choice for big-ticket items, in part because of potential rewards and in part because it can be paid off over two or three months. "Big purchases are a great chance to rack up credit card rewards, as long as you do it responsibly," Schulz said. "Save up for what you want, then sign up for a new credit card to pay for it. If you've got good credit, it's an easy way to bring down the real cost of these big-ticket items." Shultz says it's important to have the money in the bank to pay for the big-ticket item, so that you can pay it off in one billing cycle and don't have to pay any interest. To maximize your return, he suggests signing up to a new rewards credit card that provides a bonus if you spend a certain amount in the first three months. Consumers made an average of about five purchases of over $500 in the last year. By doing a little planning, those big purchases won't cost quite as much.